I reuse jars from jam, coconut oil, etc. to store my stock. I told you about the slow cooker class I ran at our local food pantry. One of the things we talked about in the class was how to turn your kitchen scraps into a rich, flavorful vegetable stock. Kitchen scraps? I mean the odd bits of carrots, onions, onion peel, garlic bits, broccoli stems, scallion greens, etc., that you don't need for a recipe and that often end up in the trash or compost. Kitchen scraps straight from the freezer ready to become stock. Instead of tossing all those odds and ends, gather them up in a freezer-safe bag or container and put them in the freezer. Keep adding to your container any time you have some vegetable scraps. You can even include the papery exterior of onions and garlic. Just make sure everything is washed before you cut them up, and you will know that your scraps are clean. 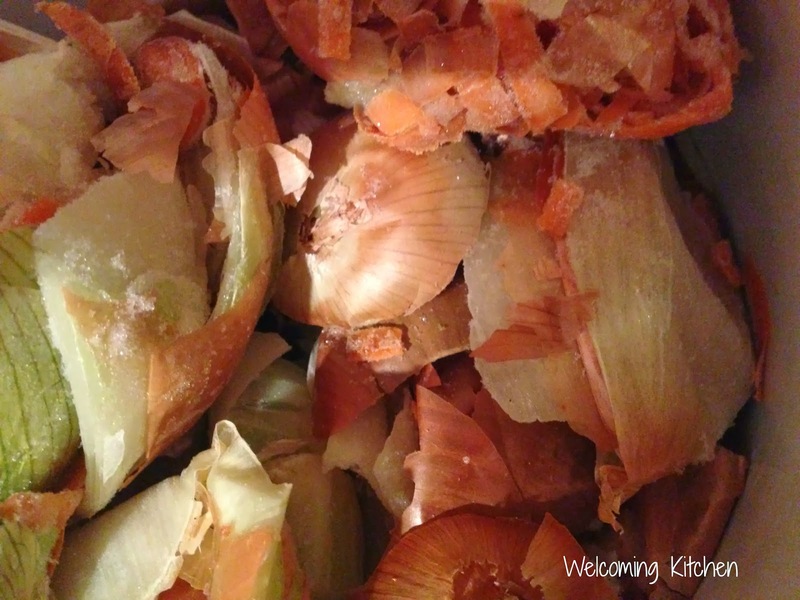 Once you've collected a fair amount of scraps saved (for this batch, I used two quart-size freezer bags), you're ready to convert them into a lovely stock. 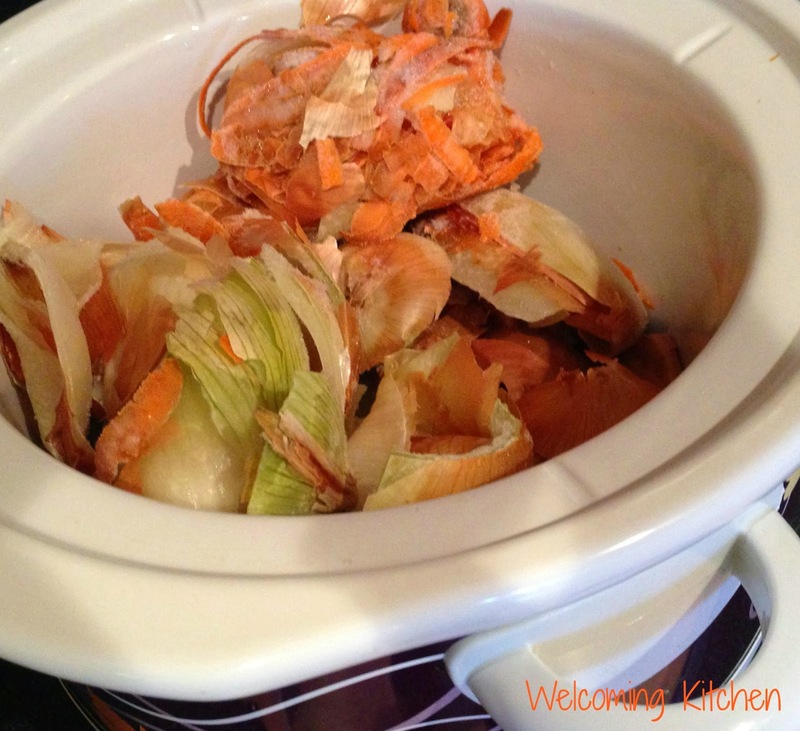 Dump the frozen vegetable scraps into your slow cooker. Top with water, leaving a couple of inches at the top. You could be done with it cooking on high for 4 hours, but the flavor will be deeper if you let it cook for 6 to 8. When it's done cooking, strain it through a colander. Use the back of a spoon to press down on the vegetables and get as much liquid out as you can. 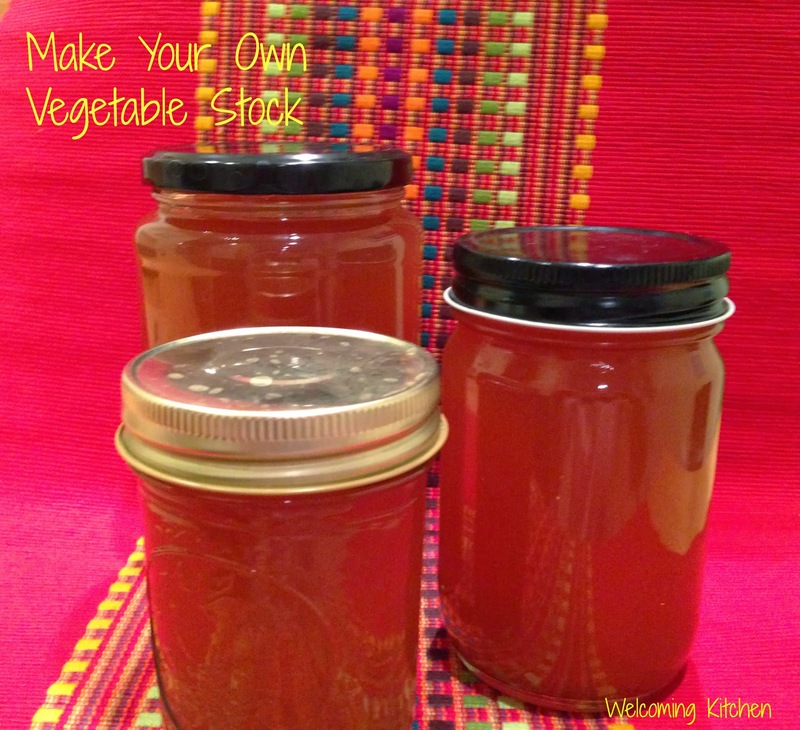 You can refrigerate it in jars or freeze it in 2-cup batches for later use. This is a basic, unseasoned stock. You can add salt, pepper and other flavors to your liking either when you're making the stock or after it's finished. With 2 quart bags full of scraps, I got over 3 quarts of vegetable stock. You can use your stock as a base for soup, as a cooking medium for rice, quinoa or amaranth. I shared this post with Wellness Weekend and Gluten-free Fridays.